Solomon's seals are graceful woodland plants, including several species native to North America. Long grown in shade gardens for its arching stems and dainty white flowers, it was selected as the perennial plant of the year in 2013 by the Perennial Plant Association. 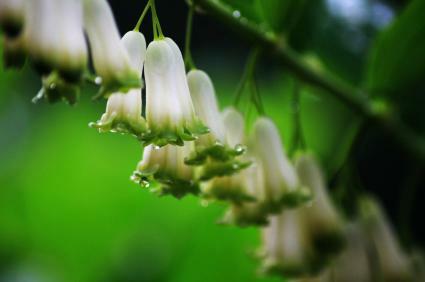 The foliage of Solomon's seal is exquisite with its smooth, succulent texture and clean, tidy appearance. 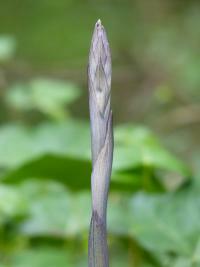 Resembling a stalk of asparagus at first, single unbranched stems emerge from the ground in spring, arching gracefully to reach two to four feet in height on average, each with pairs of oval leaves that are largest at the base of the stem and taper in size as they move toward the tip. Half-inch white blossoms that look like tiny lilies dangle from the stems in late spring, eventually turning into dark-colored berries. With the first frost in fall, the plant dies to the ground where it remains dormant until spring. 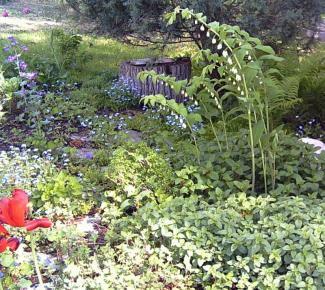 The plant needs shade, at least in the afternoon, and thrives in rich, moist soil. However, it is surprisingly drought-tolerant once established for such a lush-looking plant. Over time an extensive mat of rhizomes will colonize the soil, sending up stems in scattered locations over a large area. The rhizomes are very tough and hardy, so even if something happens to the aboveground portion, the plant will always re-grow from the roots. Solomon's seal is perfectly adapted for the conditions that make life difficult for many other shade-loving species: it grows just fine in soil thick with the roots of large trees, its rhizomes creeping around and popping up unexpectedly. Its upright architectural form compliments the many other low-growing shade plants, such as hostas, oxalis or creeping Jenny. Maintenance is minimal. They need regular irrigation when they are young and benefit from a thick layer of mulch at all times. Spreading a layer of compost over the root zone each fall is a good way to create the optimal soil conditions for lush growth. In the fall, the stalks can be cut all the way to the ground. 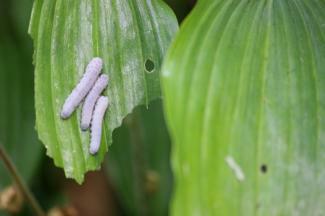 The plant is generally free from disease, though there is one pest that it is prone to: the Solomon's seal sawfly. These tiny insects lay their eggs inside the stems. When they hatch the larvae crawl out and feed on the lush foliage, often completely defoliating the plants. Fortunately, the stems will always re-grow from the roots, but if an infestation of sawfly occurs, their growth can be seriously hampered. The best approach is to pick the larvae off by hand as soon as they are observed or to try killing them with an insecticidal soap. 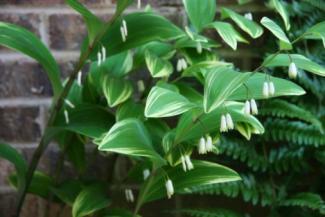 Plants in the genus Polygonatum are considered 'true Solomon's seal'. Various other species go by the name 'false Solomon's seal' which share some physical traits in common, but are distinguished by having flowers and berries only at the end of the stem, rather than along the length of it. 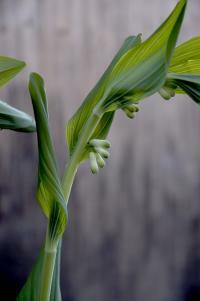 Polygonatum biflorum is native to eastern and central North America and is often referred to as Great Solomon's seal, because it is the largest species, sometimes reaching up to six or seven feet in height. Prince Charming is a dwarf variety growing to only 12 inches in height. Polygonatum odoratum is a much smaller plant from Eurasia bearing lightly fragrant flowers and often referred to as scented Solomon's seal. Flore Pleno is a double-flowered scented variety. Variegatum has creamy white streaks on the leaves. Elegant and tough sum up the reasons Solomon's seal is such a popular garden plant. Besides being one of the top rated shade species today, it has a long history of use a medicinal species and food plant among indigenous groups and makes a decadent, long lasting addition to flower arrangements indoors.